Considering Fallout 76’s rocky (to put it mildly) launch, you’d think Bethesda would be bending over backwards to keep the few dedicated fans of the game happy. That doesn’t seem to be the case. Instead, Bethesda appears to be trying to squeeze as much money as possible out of them. Need an example? 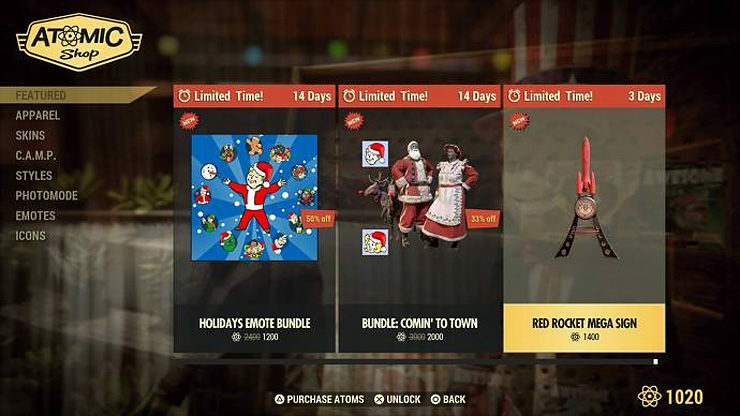 Well, Bethesda recently added a new “Comin’ to Town” bundle to the in-game Atomic Shop. It includes Santa and Mrs. Claus skins, a Christmas camp decoration, and two icons. So, how much would you expect to spend on something like that? If I was in the festive mood, I might be convinced to part with two or three bucks, but not much more. Well, Bethesda is charging 2000 Atoms for the bundle, which would require you to spend $20 worth of real-world money. And that’s the sale price! The regular price is 3000 Atoms, or around $30. That’s half the price of the full game! The Atom Shop features plenty of other overpriced digital goodies, including a Red Rocket sign for 1400 Atoms and a number of individual skins for over 1000 Atoms. Needless to say, Fallout 76 players aren’t exactly pleased with these prices. For the sake of comparison, just a few years back Bethesda charged $25 for Fallout 4: Far Harbor, a full expansion with over 10 hours of gameplay. 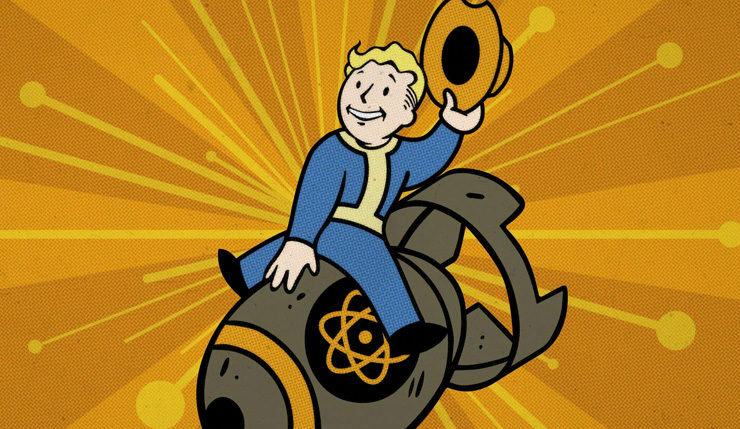 Of course, Atoms can be earned in-game in Fallout 76, so the new Atomic Shop items could, technically, be acquired for free, but grinding for them can be a slow process. Like most live-service titles, Bethesda has purposefully balanced Fallout 76 to encourage the spending of real-world cash. In other Fallout 76 microtransaction-related news, those digging through the game’s latest changelog have reportedly found numerous references to “lunchboxes,” which would potentially offer faster leveling, more inventory space, and other gameplay benefits. There is speculation you may be able to buy these lunchboxes with Atoms, although that definitely isn’t confirmed. Bethesda has specifically said microtransactions will be cosmetic only, and they have to know there would be a meltdown if they went back on that, so it’s quite likely this is just a false alarm. Even if the lunchboxes thing is false, it’s disappointing to see Bethesda already ramping up Atom prices to such a degree. The message seems pretty clear – we’re less interested in winning over new fans than with making a few extra quick bucks where we can. Fallout 76 is available now on PC, Xbox One, and PS4.